It is now clear to me that Fall is here to stay. Prepare for scarves, hoodies, and beanies on campus/elsewhere. I wanted to quickly share a really easy recipe for those still with some apples hanging around the kitchen from that one time you went apple picking. We have to make room in the fridge for pumpkin everything anyway. 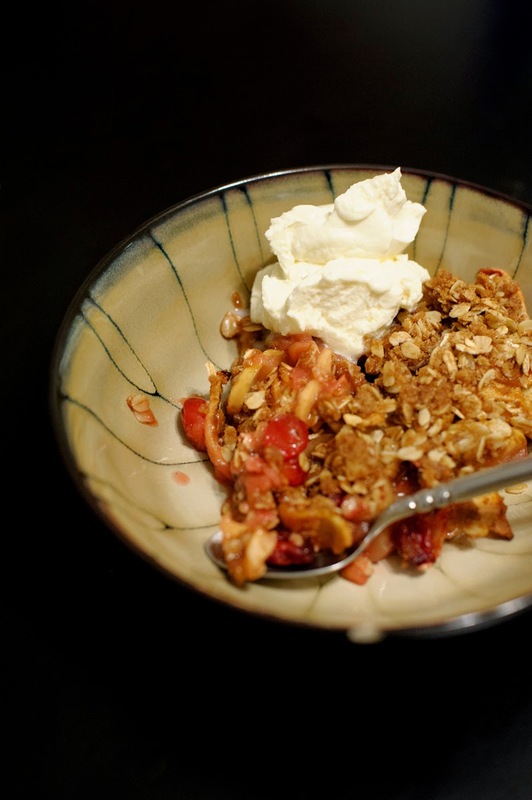 While you wait for an updated cookie recipe, here’s some soft-yet-crunchy apple-cranberry crisp! Really, the hardest part is cutting the apples. Here’s to recipes turning out the same as their picture! 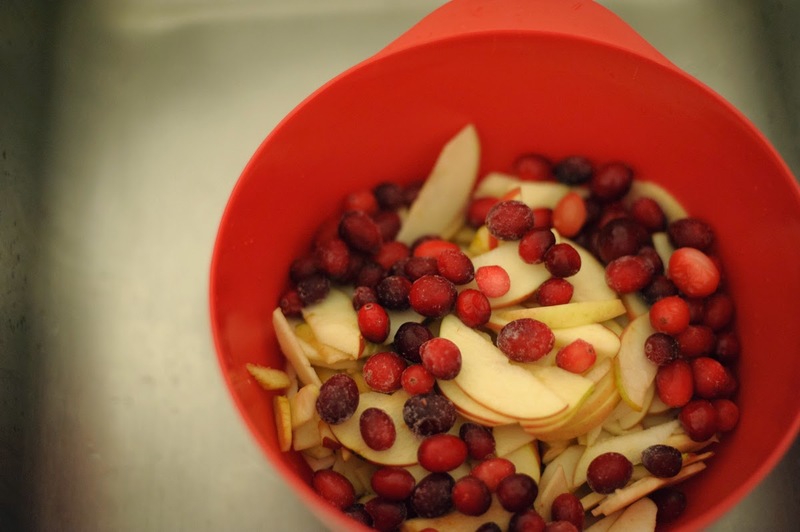 In a large mixing bowl combine apples, cranberries, and granulated sugar. Transfer to a 2-quart square baking dish or a 9-inch pie plate. 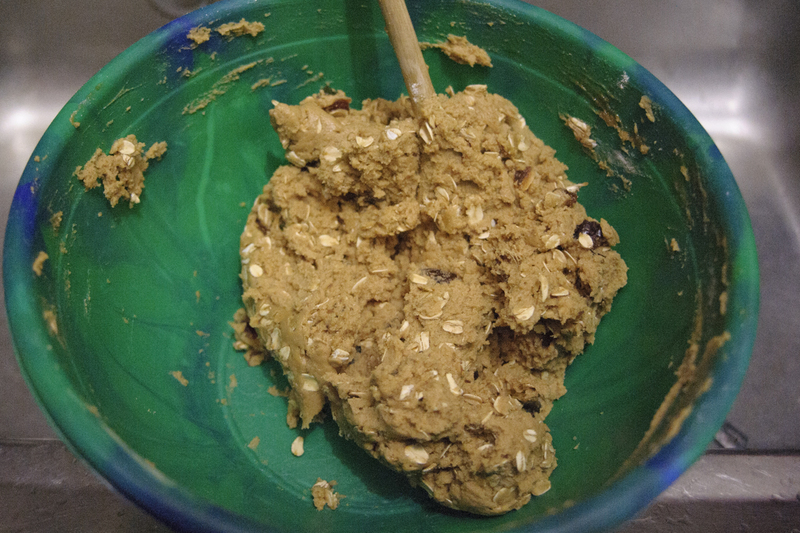 In a small bowl combine oats, brown sugar, flour, and cinnamon. Cut in butter until crumbly. Sprinkle oat mixture evenly over apple mixture. 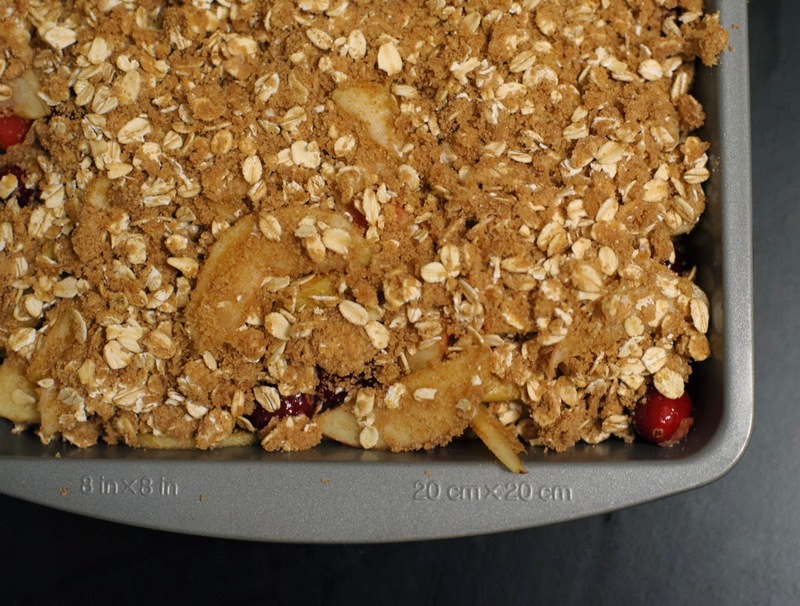 Bake in a 375 degree F oven for 30 to 35 minutes or until apples are tender. Serve warm with a dollop of ice cream or whipped cream. Makes 6 servings. In other news, the (no longer) new school year has brought a new food blog! I’ve come together with other college bakers/cooks to bring you varying recipes and kitchen adventures. We call it College Bakers’ Collective, and you can find it right here. It’s been really cool getting to see what other college kids, who are just as busy as the next kid, are up to in their kitchens. Come say hi; if you’re waiting for something new from me, there’s a good chance something has already been posted @ CBC. Stay warm, kids! EVERYONE GUESS WHAT! I made cookies. 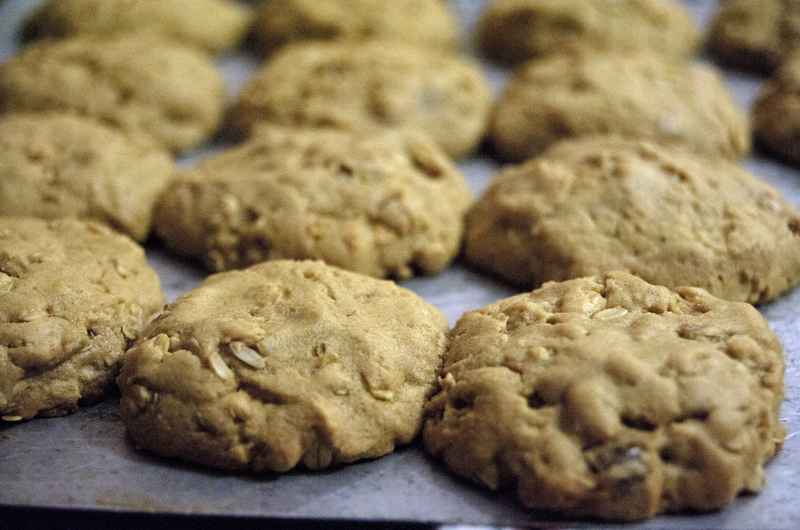 Duh, I made cookies…I mean I created cookies. How is this the first time I’ve made a cookie recipe, you ask? I’ll get back to you on that. But it looks like it took traveling 5000 miles from my kitchen to do it. Don’t worry, it will happen again! And it’ll only take me 300 miles. But here’s what happened. My uncle bought a good 3 kilos of rolled oats after giving up on the instant lifestyle (darn). He kindly asked if I would be willing to help him make some cookies with them (or something like that). So what does bored old me do with a clean kitchen in the dead of night when everyone’s gone to bed? Get cReAtIve. And too creative, by the sounds of it, right? Don’t worry, read on! ….yeah. So I had the basics: butter, sugar, flour etc. I decided to try the dark brown sugar that was around, which was a successful first. It’s also expiring on Thursday. 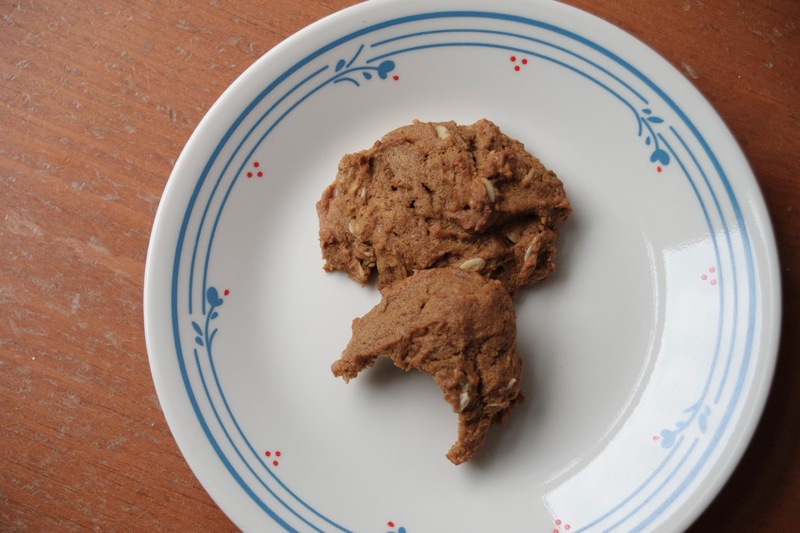 Here was my “logic”, if I had been thinking rationally (I think it’s all subconscious at this point): peanut butter cookies are a norm, and so are oat and date cookies (soo good, you can actually check “my” recipe here!). Oats and peanut butter could be easily paired together. This combo might need something sweet to cut the thickness/nutty flavors. Dates are sweet. In they go! 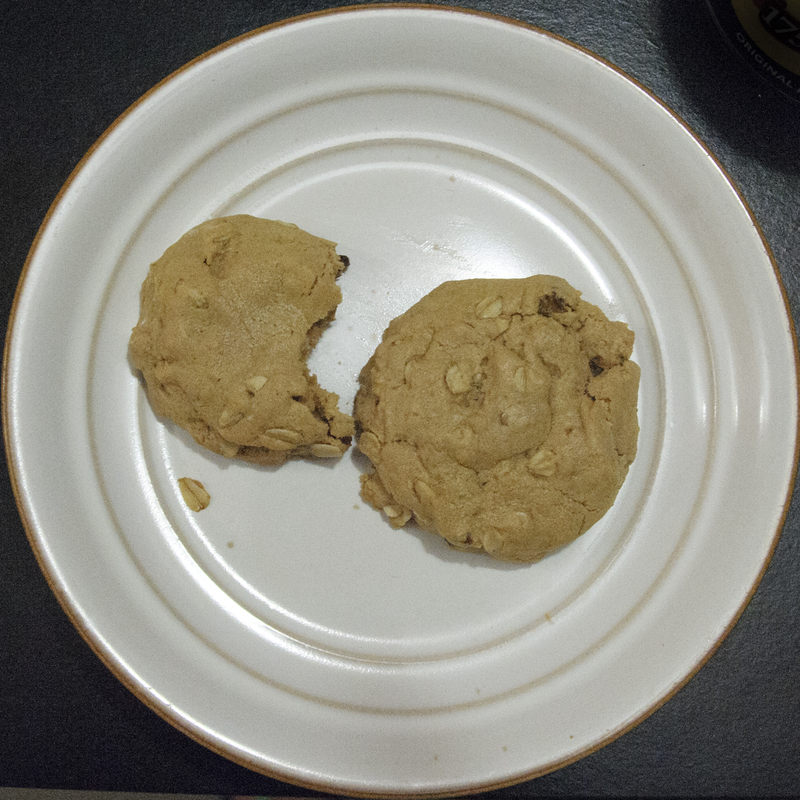 Of course, right after adding some knife fulls of peanut butter, I decided I wanted to be like those fancy gourmet bakers who stuff shenanigans into their cookies. In my ideal cookie, this would be chocolate. Just an eruption of melted chocolate everywhere. But I had peanut butter. And peanut butter is what I used. 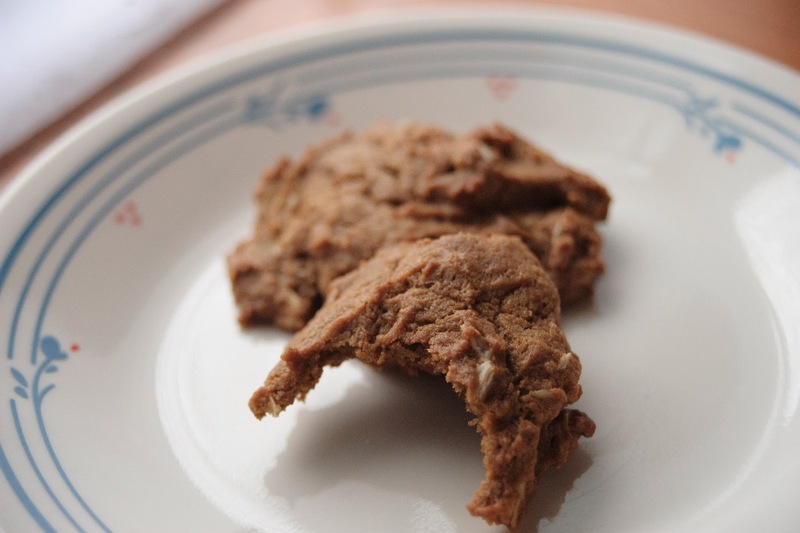 So peanut butter cookies became stuffed with peanut butter. And it was an excellent choice. If you’re not so into PB, you can skip that part, but don’t skip the PB in the dough because it’s mild and lovely. 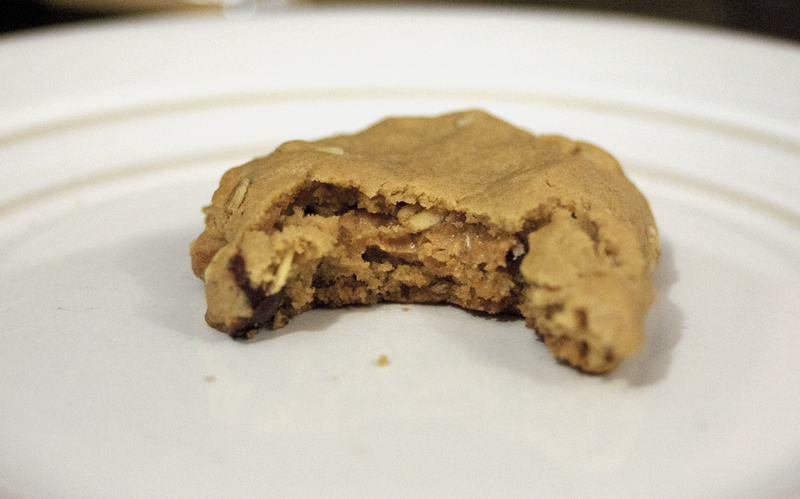 I made some normal cookies so I wouldn’t overwhelm with the decadence, and they were good too. Alright, enough of the blog banter, let’s get y’all baking these. And I must warn you that some of these instructions and measurements are approximate, for I guesstimated a temperature from the knob on the gas oven and kept adding more of stuff. Who goes exactly by the recipe, though? They’re more like guidelines, anyway. Preheat the oven whenever you want, but it will be at/around 360 degrees. Butter two cookie sheets and set aside. Combine your softened butter and sugars in a large bowl until smooth. Add the egg and vanilla and mix well, then add the peanut butter. Gradually mix in the flour, baking powder and salt. Add in the dates, making sure they separate in the dough. Gradually stir in the oatmeal. 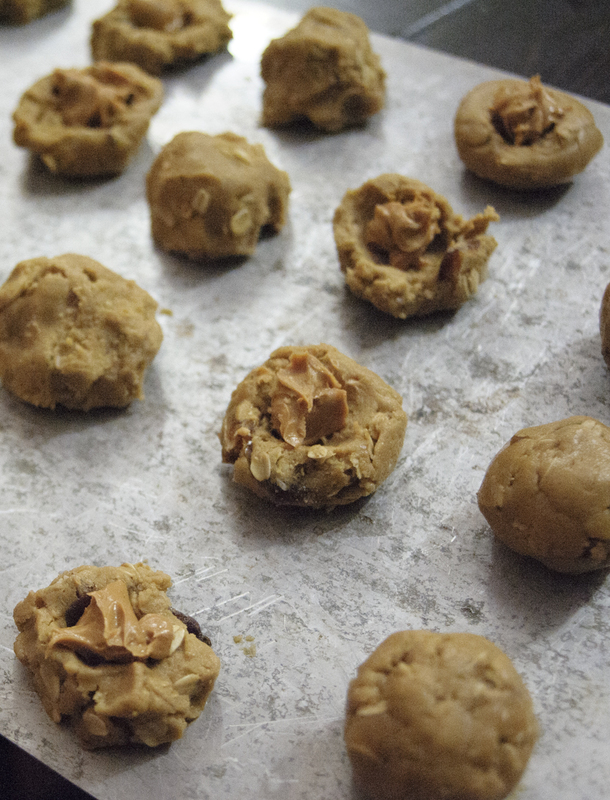 To make stuffed cookies, make small balls of dough, using just over half the dough, and place on the cookie sheets. 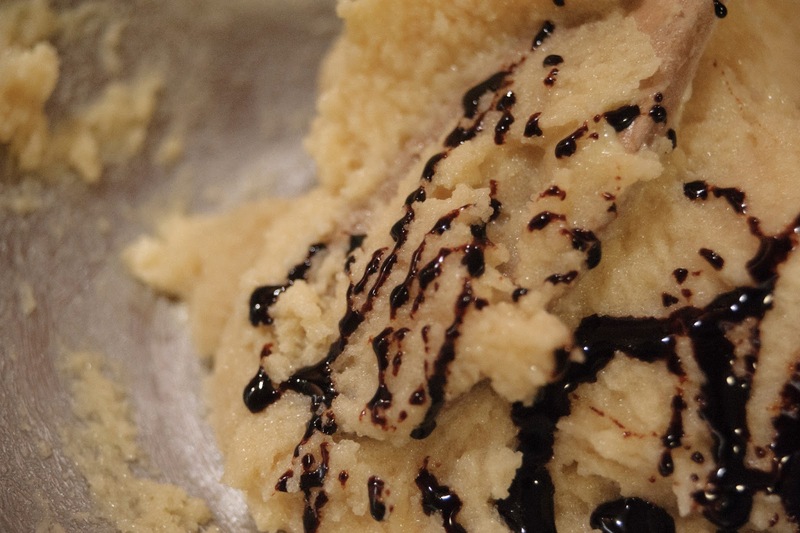 Use a spoon to make a small well in the dough. Place in the refrigerator for 30 minutes to stiffen. 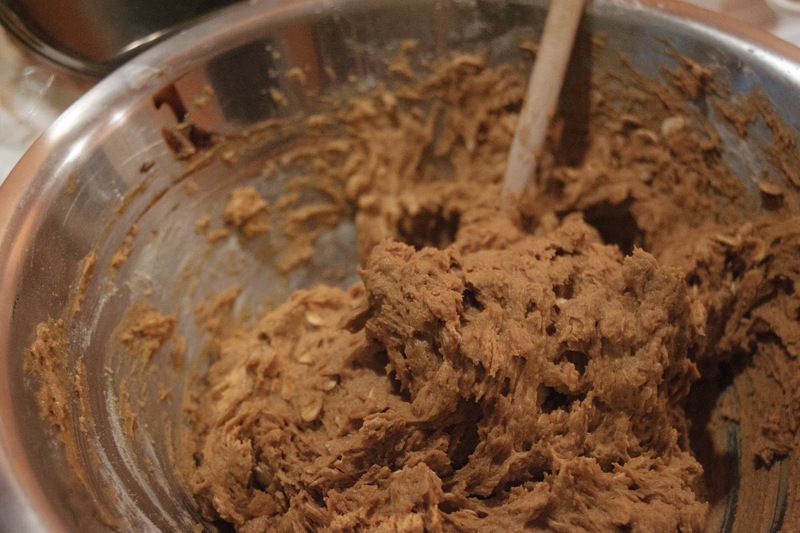 Place a 1/4 teaspoon of peanut butter in the well of the dough. Use your hands to flatten small tops to cover the peanut butter. Diligently seal the sides of the cookie so the peanut butter doesn’t escape. 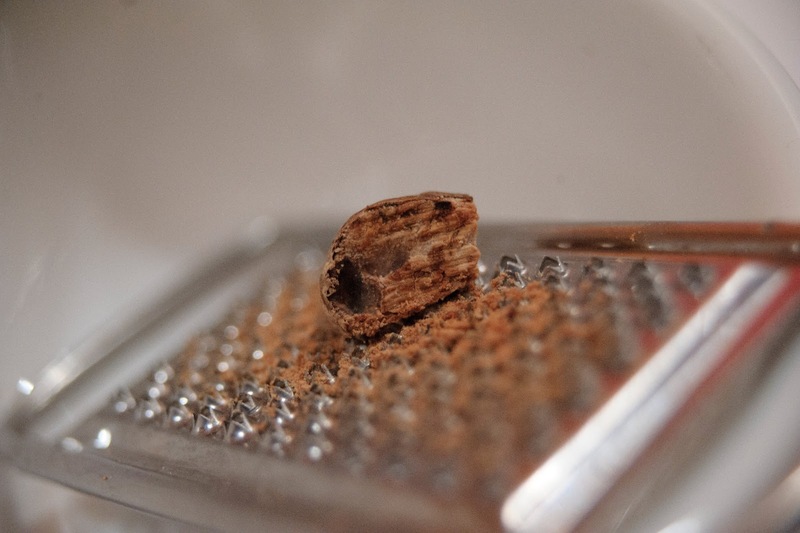 Bake for 10-12 minutes, or until a toothpick comes out clean/with just peanut butter. Ok who has the same plates as we do? I was running low on flour, yet I had the baking itch. Some timing that was. Too indolent (yay vocab words) to figure out what to make while my dad stopped at the too-far-and-too-lazy-to-go co-op just for me, I used all the resources at my fingertips at the time (all nine). When faced with the request “Aaaah quick someone tell me what to bake.” in the form of a Facebook status, Facebook really delivered. I went with former classmate Mandy’s Pumpkin Oatmeal Cookies, from Post Punk Kitchen, on their game once again (recall the college-ified chocolate chippers)! Excellent choice. There was definitely more chatter than I was expecting on that status. About eight people’s worth. I think I could make this work to my advantage. Might make it a new theme: mandatory recipe usage from comment of Facebook status…uh oh. Since this was a vegan recipe, there’s no egg or butter. But you can change this if you want, though the texture without is just fine. Key players are now canned pumkpin, molasses, cinnamon and nutmeg. Preheat oven to 350. Have ready 3 greased baking sheets. 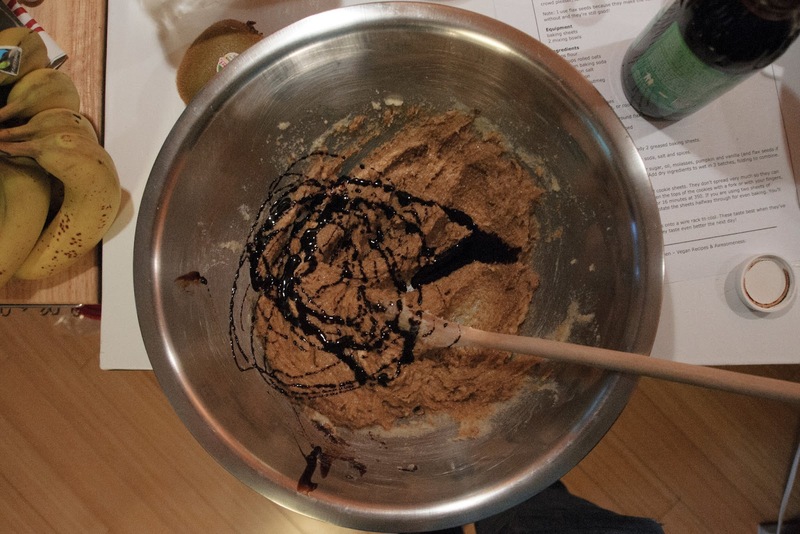 In a seperate bowl, mix together sugar, butter, molasses, pumpkin and vanilla until very well combined. Add dry ingredients to wet in 4 batches, folding to combine. Let’s do this again, social media outlets. Speaking of, my Instagram feed’s been killin it as of late, check it out for pre-blogging snaps @ http://instagram.com/carmzl …#shamelessplugging. While we’re at it, send me your favorite cookie recipe! Maybe it’ll show up here. Till next time!